This is my version of the wonderful Burdastyle swimsuit that came out a few weeks ago (pattern is downloadable here). I’ve been meaning to try my hand at a swimsuit for some time… Hoping that in the near future, my work and various papers will be all finished-finished, and some time, maybe, I’ll take a much-needed break at the beach! This pattern came in very handy as it looked better than any swimsuit pattern I’ve seen. I made this last weekend, just before Seb, the kitty and I left for Amsterdam for a fortnight (where I am now busy writing a paper and finishing my dissertation). This is my entry for PatternReview’s knit contest. Sizing: S-M-L, but Burdastyle forgot to add a size chart. Duh. I cut an S and the body of the suit turned out a bit loose on me, so this pattern does run a bit large. No, not at all. In fact, it’s as if the instructions were nonexistent. Some steps are entirely omitted. They don’t even tell you how to finish the swimsuit. The few instructions the writers did see fit to offer were not satisfying anyway: there was much neater ways of making this swimsuit, so I went along my own rules. Honestly, people, who wants seam allowances in a swimsuit crotch? Oh, and as was noted by Cidell and commenters on the Burdastyle website, the pattern lacks some essential information: the crotch piece and back strap should be cut on the fold; notches are missing to create gathers at the bust. The rectangle piece that gathers the insert in the middle is not labelled on the pattern sheet. ETA: Burdastyle have just updated the pattern with the relevant information. Except one pair of notches is still missing to make the gathers at the bust – those at the top of the insert (? ); the corresponding notches are also still missing on the strap, methinks. I fell in love with the swimsuit as soon as I saw it. Personally, I hate feeling like I have to wear the equivalent of underwear in public just because I’m at the beach. Don’t misunderstand me – I have absolutely nothing against women who do feel at ease this way (I strongly believe that everyone should do as they please, as long as no one else is hurt) – it’s just that I can’t. This suit seems to achieve the impossible: it will make me feel at ease while being super cute and a little glamorous. Fabric Used: Poly-lycra jersey knit with a four-way stretch. I got it from Fabric.com a year ago- it kind of jumped into my cart as I was buying some batiste for my dupioni gown. It cost me ridiculously little (less than 2 dollars, i.e 1.3 euro) and I needed less than a yard for this project (yes, I can still make a tank top out of the remnants). 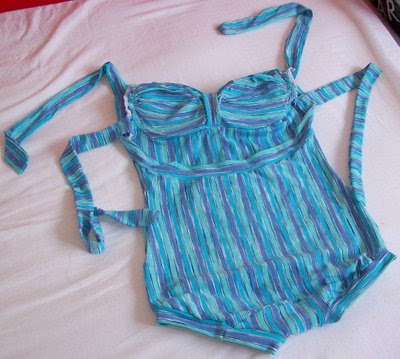 Since the pattern is free, the only significant cost for this swimsuit was the bra cups – 4 euros. Do you have any idea how much a swimsuit costs in Paris? He he. – I inserted bra cups between the shell and the lining to add some support. – I wanted the legs to be a bit longer (the shorty style was really not quite there after hemming), so I unpicked the hem (ack) and cut strips to create a binding. I cut the pieces slightly (1 cm) narrower than the bodice binding. – I made the most of my striped fabric by cutting the body vertically, the insert (bust) horizontally, the center tab vertically, and the leg’s binding and bodice binding/straps horizontally. Fun! I don’t need another glamorous swimsuit; I recommend it to intermediate to advanced seamsters that are up for a challenge. This was such a gratifying project. Apart from underwear and a couple of jeans, I haven’t bought any clothes in over two years. My dream is to make absolutely everything I wear (apart from jeans, but including underwear), and this showed me I really could! I’m happy that I have now reached a level of skill (and of confidence) that allows me to tackle a pretty technical project with no real instructions and some significant pattern faults, and to actually manage something that doesn’t look wonky (I hope!). It may sound that I’m bashing Burdastyle, but I don’t really mean to. I’d been wanting to be trying one of their online patterns for a long time, and while the instructions and markings on the pattern were sometimes seriously lacking, the pattern itself was very well drafted. Plus, this style is truly unique. And, hey, the pattern is free! Merci, Burdastyle! Assemble swimsuit’s body back to front right sides together at side seams. Assemble crotch lining to front and back of the swimsuit’s body, with lining’s right side against the swimsuit body’s wrong side. Try the suit on, make alterations to fit if and where needed. You can now serge the side seams. For a neater finish, you’ll now have to sandwich the body’s seam allowance (front and back) between the crotch and crotch lining. To do this, stitch crotch outer piece to back right sides together. Then to stitch the crotch to the body’s front, right sides together, you’ll just need to scrunch the crotch lining out of the way. There should still be enough room to do the seam on the machine. (If you’re having a Bree tendency, like I did, make sure you match the stripes at the crotch. Not that anyone will look that close at that particular spot, but it’ll make you feel better). Trim the crotch seam allowances. Turn them to the inside. Fold the “front insert” in half. Make 2 rows of gathering stitches, on each side, for *both* the insert and insert lining (you’ll need to make them separately as we don’t want to attach the insert and it’s lining at this point, for a neater finish). Start about 1 cm after the insert’s curve at the bottom, and stop about an inch from the top (i. e., the fold). Try the suit on and pin the cups to the lining’s inside, where you need them to be (careful with those pins, ladies!). You’ll be sewing the cups onto the inside of the lining (not directly against your skin). The cups will be hidden between the lining and the shell. Adjust the gathers so that they are spread evenly over the cups. Stitch the cups to the lining’s inside, using a narrow zigzag stitch. Stitch the insert to the swimsuit, right sides together. As in step 2, the bodice will thus be sandwiched between the insert’s shell and lining, and no seam will be visible on the inside or on the outside. This is made possible because we haven’t assembled the insert’s shell and lining at the side seams yet, thus leaving an opening allowing to do this seam on the sewing machine. If desired (though this can be left out – Cidell’s sans tab version is also very cute), add the center tab to gather the insert in the middle. Fold the piece lengthwise right sides together, sew the long side, turn right sides out. Fold under one of the short ends, attach to the bottom of the insert’s lining. Fold the other short end under, attach to the bottom of the insert’s shell. Baste the insert’s and lining’s sides together. Fold the long strap piece wrong sides together. Mark its center, and mark the back of the swimsuit’s center. Pin the folded strap’s center to the swimsuit’s center. Stitch the strap to the swimsuit, pulling on the strap as you sew. This will make the strap stay snugly against your body as you wear the swimsuit. Stop one each before you reach the insert’s top. Make a 1-cm notch perpendicular to the strap’s raw side, right at the top of the insert. Turn the straps to the wrong side, and sew the remaining long sides as well as the short end closed. Turn the straps inside out through the 1-inch opening on top of the inlay. Sew the opening at the inlay closed. Serge/finish the binding and body’s raw edges together. Fold the back straps right sides together and stitch the long side and one short side closed. Turn inside out, pin where you want them to be (I pinned mine at the bottom of the bra cups). Stitch them to the seam allowance only, being careful not to catch the body or the binding into the seam. I recommend making a double seam for added strength (you’re going to be pulling on these each time you tie your swimsuit in the back). Stitch the long side closed. Turn inside out. Stitch either end of the strap onto the seam allowances of the swimuit’s sides. Measure the legs’ opening’s perimeter, and cut 2 straps in this length, plus seam allowance. Width: I cut mine 1 cm narrower than the body’s binding. Again, you may want to cut them just a bit shorter, to make them sit snuggly at the legs – but not too snuggly, or your legs will look like stuffed sausages. I pulled just a tiny bit on the band while attaching it to my leg opening. Sew the bands closed on the short side. Attach to the legs same as you did for the body’s binding. Serge/finish bands’ and leg’ raw edges together. I hope this all made sense. If not, give me a shout and I’ll try and be clearer! Here’s a tiny pic to show how it fits – but I won’t be showing any other picture on this blog. As you can see, I made a hair band to match. Thanks for the detailed swimsuit post, I should have read it BEFORE I tried to make my “muslin” of the swimsuit. You can see my silly 1980’s version on < HREF="http://onetwothreejump.com" REL="nofollow"> my site<>. The not-fun of trying to make it is still too recent in my memory to try again, yours turned out so nice so I must try again eventually! Thanks for posting this tutorial – I now feel much more confident about trying out the pattern! Kim has added their version of your project on crafty community Cut Out + Keep and we thought you might like to see how it turned out. You are my new hero! I am so looking forward to giving this a try and I'm very grateful for your tips. 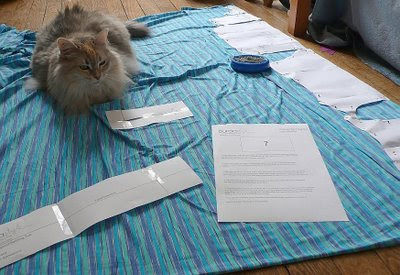 The picture of your cat on the fabric you are trying to cut out is so true! It's like they see fabric laid out and they think it's just for them. I just wanted to thank you for this tute! So incredibly helpful! 🙂 Really, I would've been totally lost without it. I belive that you said you are living in Paris? I am also living in France and I would love to buy some fabric to make this suit. Do you order fabric online or do you buy it in a store? If you do buy it online could you tell me where. All the lycra fabric that I`ve found is solid colors and not too exciting. I like your fabric and I would prefer ordering from France. I dont know any good fabric stores here yet! THank you so much! Love the suit! Especially the leg binding. Great job! I'm ready to try this, thanks to your instructions!